The primary attractions for most visitors to Alaska are its vast wilderness and amazing natural features. With fewer than one person per square mile and most residents concentrated in population centers, huge areas of the state are virtually empty of humans and their activities. You can step out of the Katmai Wilderness Lodge on the south coast, hoist your pack, and head for the North Poleknowing as you do that you need not meet a single human, cross a single road, or walk under a single power line. Of course, youll want good maps, food caches, mosquito repellent, the zeal of a missionary, a copy of Micheners Alaska, amazing luck...and maybe a gun. Its hard to fully grasp the scope of Alaskan wilderness. Only in the southcentral region of the state is the pattern familiar. Here, definable wild regions are segregated by highway arteries beaded with towns, most of which are tiny and far apart. Elsewhere, lonely roads head away from the population centers, piercing the larger wilderness, only to end at a wide river, coastal town, or cluster of lodgings. Beyond these points, human habitation is accessible only by foot, horse, air, boat, dogsled, or snowmachine. Small road systems exist around Nome, Kodiak, Juneau, and a number of other towns, but they do not connect with the continental grid. Despite the wildness, there is a persistent illusion of civilization that affects many travelers to Alaska. When youre on a road, behind a train or bus window, or gathered with others on a ferry deck, your view is always half civilized. Often, it takes a jolt to shake you from a secure perchas when your vehicle breaks down at night on the road to Prudhoe Bay, or the plane that is to pick you up from a backcountry cabin is delayed by weather. Perhaps a bull moose galumphs suddenly into your headlights, or a bear ransacks your tent. None of these events are on many wish lists, but its important to know that Alaska can challenge your self-reliance at many points. When you push your own frontier, it might push back. Alaska is basically a mountainous statethe northernmost end of the continuous cordillera that stretches down through the Americas to the tip of Cape Horn. Several major mountain ranges cross portions of the state, all running roughly parallel to the Pacific Coast. Between the major chains are lesser mountains, broad valleys, and interior basins. Coastal plains are found in the north and west. In understanding the lay of the land, I find it helpful to distinguish three broad geographic regions that have clear identifying characteristics. The following sections examine each of them. Mountain ranges and mountainous isles stretch along Alaskas south coast in a swath 50 to 200 miles wide, dominating the landscape and creating a rugged and wild menu of wilderness-experience possibilities. Every one of Alaskas many peaks above 10,000 feet and all of its volcanoes are found within 200 miles of the Pacific (most are much closer), as are nearly all of the states glaciers. Comparatively warm ocean currents influence the maritime climate, moderating temperatures and raising precipitation levels. Due to heavy tectonic activity, volcanoes rumble, steam, and blow here with great geologic frequency. Amazing destinations like the Valley of 10,000 Smokes in Katmai National Park and the 6-mile-wide Aniakchak Caldera in Aniakchak National Monument are the results of this volcanism. Perhaps more telling of the tectonic activity in the region is the fact that the strongest earthquake ever recorded in the Western Hemisphere (by some estimates) occurred here on March 27, 1964. Anchorage and numerous coastal Alaskan towns were devastated by the quake that has been estimated at anywhere from 8.4 to 9.2 on the Richter Scale. Hundreds of miles of coastal lowlands subsided as much as 6 feet, while mountain ridgecrests may have risen just as much. Tsunamis from the event caused massive destruction throughout the region. Walled off to the south by the Alaska Range and Wrangell Mountains, and to the north by the Brooks Range, Alaskas vast Interior encompasses more than half the state. The region is dominated by the Yukon River, which flows east to west from the Yukon border to the Bering Sea. Between the Yukon and other rivers are wide ranges of low mountains and high hills. Combined with difficult river crossings, boggy flats, extreme temperatures, and mosquitoes, these rugged hills have helped to slow development in the regionthough they didnt stop the miners looking for gold. The Interior receives substantially less precipitation than the coastal mountains and basins. Temperatures vary widely, with winter lows occasionally reaching -70°F, while summer highs may climb into the 80s. Not surprisingly, access to remote areas is difficult, though it opens up in the winter to snowmachine traffic. The main features of the Interior are vast spruce forests and sprawling wetlands. Stands of aspen and birch precede new spruce growth in recovering fire areas. White spruce dominates higher and drier areas, while the very similar black spruce is found in the boggy flats. North and west of the Interior forests, the land along the shores of the Arctic Ocean and Bering Sea is stark and wide. In the west, coastal areas and valleys have short, warmish summers and long, cold winters. In the north and northwest, the Arctic climate features colder temperatures, only slightly moderated by the proximity of the oceans. High winds and extended winter darkness produce bitter windchills. The landscapes of the Far North and Arctic Coast are heavily influenced by the permafrost that underlies 80 percent of Alaska. Where the layer is continuous in the Far North, the ground is frozen solid to a depth of up to 2,000 feetthough usually much less. Summer thawing occurs only in the uppermost inches and feet, allowing a thin layer of soil to support lush plant life atop of what is basically a giant ice cube. The melting of surface layers, as well as the nonporous qualities of the layers beneath, creates lakes and pools in the poorly drained permafrost. Refreezing causes the soil to buckle, creating domes called "pingos" and polygon-patterned networks of low dikes. In some locations, pingos rise as much as 200 feet above the surrounding flats, demonstrating the power of the freeze/thaw cycle. Since permafrost often underlies slopes and hillsides as well as flats, many Far North or Arctic Coast walking routes that look open and easy from a distance turn out to be slogs through sopping tundra. In general, the presence of forest and brushy ground cover is a sign of more stable, better-drained soils. Foremost in the minds of many people when thinking of Alaska is the states fabulous wildlife. This is still a place where the ecosystems are intact and the migration routes uninterrupted. In the lower 48, the accidental introduction of hundreds of exotic plant and animal species has changed the face of nature forever. Not so in Alaska, where the progression has been comparatively untainted since the last ice age. In addition, the free interaction of healthy animal populations remains virtually unhindered by barbed wire, tract homes, or interstate highways. Surprising to many is the fact that, in many areas, the population density of certain well-known species is really quite low. Large animals need a large territory, particularly where conditions for survival are difficult. Harsh conditions and a short growing season limit populations in many areas. Fortunately, wildlife viewing of the most popular species is relatively easy due to the prevalence of open terrain, good understanding of animal habits and migration routes, and access to locations where wildlife concentrates. All three bear species found in North America are found in abundance in Alaska. Observing any of these beasts browsing, preying, fishing, or mating can be the highlight of a visit, and the chances to do so are many. Money buys "guaranteed" opportunities, but with a little planning and persistence, the chance for sightings is high for any traveler. Black bears are the smallest of Alaskan bears, weighing up to 400 pounds and reaching 6 feet in length from nose to tail. They are often distinctly black, but can also range in color from dark brown to medium brown and cinnamon. Blacks are easily distinguished from brown bears by their size, lack of shoulder hump, and more dog-like snout and forehead. More than 50,000 black bears live in Alaskas coastal and Interior forests, but are seen less frequently than grizzlies if at all by many tourists. Look for them in clearings and at the forest edge. They are often sighted along the Cassiar Highway in northern British Columbia and on Prince of Wales Island west of Ketchikan. Polar bears live mainly solitary lives on the polar pack ice off the coast of the North Slope and Seward Peninsula. They live primarily on seals and seal pups that are vulnerable to attack when theyre not in the water. Polars come ashore in the summer to mate, returning to the pack ice when the ocean margins freeze in November. While ashore, they may seek food in inhabited areasusually when they smell human-produced odors from garbage, cooking, or hunting. They are fantastic swimmers and travelers of the pack ice, able to rapidly cross ice and water, pull themselves onto bergs in one fluid motion, then leap from the far side with graceful dives. Easily the most dangerous of all bears, polar bears cause more injuries to humans per encounter than the others. Unlike grizzlies and blacks, polars are pure carnivores functioning in environments with very little distraction and cover. Your presence and movements can challenge them for a variety of reasons, including hunger. Before exploring the Arctic Ocean coast and ice pack, talk to locals and outfitters about recent bear behavior. As with any bear, it is highly unlikely that youll have any problems, but follow prevention and reaction advice with care. Ursus Arctos, the Alaska brown bear or grizzly, is the worlds largest land carnivore and the undisputed king of beasts in the North. About 40,000 live in the state, as compared to a total population of fewer than 400 in the lower 48. They are found everywhere in Alaska except the Aleutians and several islands in the Bering Sea, Southcentral, and Southeast. The greatest concentrations are in the mountainous islands and coastal foothills of the south coast. Premier areas for viewing brown bears include Admiralty Island and other locations in the Southeast, Kodiak Island, and the Katmai region west of Cook Inlet. The easiest and least expensive viewing access (no flights involved) is along the park road in Denali National Park, though viewing here cannot be "guaranteed" as it can in coastal regions. Elsewhere, a sharp eye and a little luck can reveal a bear going about its business just about anywhere you go. It is largely agreed upon that the brown bears of the coastal regions and the inland grizzlies are the same species, though they can certainly appear different to even the casual observer. Salmon-fed browns can be huge, some males reaching over 1,500 pounds, with fur that ranges from medium to dark brown. They may seem a bit more verticalless "stretched out" than their inland kinand the fur around their faces sometimes seems to frame the eyes and snout, almost owl-like. Coastal browns gorge on high-protein, high-fat salmon for much of the feeding season, enjoying a consistent and easy feast of plenty. Denali and other Interior bears are considerably smaller in maximum size, occasionally reaching 1,000 pounds. They have been known as grizzlies rather than brown bears, and include a sub-category of barren-ground grizzlies that live mainly above or beyond the treeline. Their fur tends to be lighter, almost blond on occasion, and may feature more distinct "grizzling"the lighter tips of the fur which shimmer and ripple when the bears move. Interior grizzlies face a harsher climate and a diet much lower in animal fat and protein than their coastal kin. They roam relentlessly, consuming mainly berries, roots, shoots, and various plants. When possible, they will feast on ground squirrels, moose calves, caribouon anything nutritious that they can catch. 1. Adopt a bear-repelling profile of behaviorsMake noise when you hike by tying a bell to your pack or singing or talking loudly. Set up your camp away from roads, trails, animal carcasses, flocks of scavenger birds, known bear hauntsanywhere that would attract or provoke a bear in the area. Cook, clean, and store all food well away from your campsite. Use bear-proof containers to store food and fragrant items. 2. Be part of a managed situationKeep dogs leashed and the leash in your hands. Watch out for children, keeping them still, quiet, and with you when observing bears. Avoid observing with groups of people if any of them are behaving inappropriatelyespecially if they have food or are stupid enough to try to feed bears. Follow any official advice offered for the particular location you visit and activity youre involved in. 3. Never approach a bearparticularly a mother with cubs (any pair or trio of bears with one apparent leader is a mother with cubs, regardless of size). Two hundred yards downwind of a lone, foraging bear is more than close enoughthough you can get much closer to salmon-fishing browns in designated viewing areas. 4. If a grizzly becomes aware of your presence and sniffs or approaches (either because you surprise it or pass upwind) do not run!As to what you should do, opinions vary a bit. My interpretation of the consensus is that you should hold your ground, identify yourself as human by talking calmly, loudly, and firmly, and wave your arms. Face the bear and stay vertical (dont bend over), and back slowly, diagonally away. 5. If a grizzly charges, do not run!Hold a frozen, face-on, vertical but submissive posture and keep talking until the last possible instant, then drop to the ground in a fetal position or flat on your stomach, with your arms protecting neck and face. Play dead, remaining very still until you are certain the bear has moved well away and is no longer interested in you. Bear charges are often bluffs. Premature rapid motion or fleeing on your part will trigger a predatory response from the bear that all but assures a biting and/or mauling. In general, this advice applies to all bearsthough by most accounts, you can take a firmer, louder approach with black bears and should fight blacks vigorously in the rare instance of attack. Remember that people die from bear attacks in Alaska only once every four or five years on average. Compare that to two per year dying from dog attacks and several in car accidents. Ive never had a negative encounter with any of the many bearsblack, brown, or polarthat Ive observed. Alaskas approximately 7,000 timber wolves are spread throughout the state. Individuals can reach 175 pounds and over 6 feet in length from nose to tip of tail. They live in packs of up to 35 individuals (but generally fewer than 10) in territories ranging from 50 to 5,000 square miles (including nomadic range). A dominant or "alpha" male leads the pack and marks the territory, with the alpha female occupying a secondary leadership role. The pack maintains a complex social hierarchy with posturing and vocalizations. Mating is for life. Alaskan wolf packs occupy a centered hunting range during the period when pups are born and restricted to the den. At other times of the year, packs may become nomadic, following concentrations of their primary prey, often caribou. Wolves are opportunistic carnivores, eating whatever they can catch, but focus pack efforts on large grazing animals, including caribou, moose, and musk ox. Wolves are the subject of controversy in Alaska and are still actively trapped and hunted. The Alaska Board of Game allows hunting on the grounds that wolves compete for caribou with sport and subsistence hunterswhich is certainly true, though simple math shows that its slim competition indeed. Battles over how and where wolves can be killed have made news in the last several years and will continue to do so. Public lands offices and park headquarters maintain current information regarding where wolves can be observed. Their large territories, mobility, relative scarcity, and general shyness make sightings difficult without a targeted effort. A pack has been active in Denali recently, making the park the best viewing choice for roadbound travelers. Several other species of carnivores and small mammals are found throughout the state, though few are regularly seen by touristsmainly because they are speeding from scenic site "A" to scenic site "B" and dont slow down to look around. Keep your eyes open, have those binoculars handy, and stop now and then for a walk or a long look out over the landscape. In addition to the animals listed below, badgers, skunks, muskrats, rabbits, squirrels, lemmings, voles, mice, and shrews are also found in various habitats. Unlike bears, animals including voles and arctic ground squirrels are true hibernators, sinking into a deep stupor for the duration of winter in their burrows. Bears, on the other hand, simply sleep longer and more deeply. When the weather is encouraging, some may come out of their dens to browse for food. BeaverBeavers are common in Alaskas forests and brushy upland valleys. Look for their dams and lodges anywhere you see standing water in gently sloping sections of valleys and basins. FoxRed fox are common in forested areas, particularly in the warmer south. The beautiful arctic fox is found on the tundra of the Far North. It is still trapped in winter for its thick, soft, snow-white fur. LynxYour glimpse of a lynx will be a thrill long remembered. Secretive and solitary relatives of the bobcat, they feed primarily on snowshoe hares, though they will pursue other prey (including domestic pets) when the hare population is in decline. MarmotThese chubby, rock-dwelling rodents live in exposed high country with hideouts and vantage points among the boulders. Their distinct whistle announces the approach of potential danger (also making them easy to find). Marten, Mink, and WeaselsSeveral members of the long-bodied, short-legged weasel family are found in Alaska. The smallest is the least weasel (less than 2.5 ounces), the largest is the wolverine. All feed primarily on smaller mammals, such as voles and mice, helping to control their population. Pine martens and mink are trapped for fur. PorcupinesFound throughout forested regions, slow-moving porcupines are the nemesis of curious dogs and wolf pups. They are common members of the roadkill roster in certain areasand they do not "shoot" their quills. River OttersMembers of the weasel family, river otters are common residents of river valleys and coastal environments in southern and southeast Alaska. They feed on fish, shellfish, amphibians, and small mammals. WolverinesClosely related to badgers, these rarely sighted, nocturnal predators live largely solitary lives in Alaskas forested hills. Reaching 70 pounds, they are tenacious in defending themselves and their territory. Alaskan moose are found in forested areas, usually near bogs, streams, and standing water where they can find willow shootstheir food of choice. The biggest populations are found in the basins south of the Alaska Range and on the Kenai Peninsula, though they are also common in the Interior. Larger than their counterparts in the lower 48, a big bull moose can reach over 1,500 pounds with antlers 6 feet across. As members of the deer family, male moose grow new antlers every year, the heavy racks losing their felt and reaching full size around the September rut. One or two calves are born to females in May. Look for solitary moose or small, spread-out groups in boggy areas and near the roadside, but dont approach themparticularly males during the rut and females during calving season. Unlike the rule for bears, if a moose charges you, run! Alaskas nearly 1 million caribou are members of about 30 separate herds, including a dozen major ones, each of which has distinct and relatively unchanging migratory routes and calving grounds. Male caribou can reach 500 pounds while females are considerably smaller. This helps to distinguish them since, unlike any other member of the deer family, the females grow antlers. During the summer, the herds disperse somewhat and concentrate on feeding. Caribou can be seen singly or in groups of various size in more open terrain, often walking or running. In insect-heavy areas, look for the occasional caribou sitting on a patch of late-melting snow to escape the torment. Dall sheep are close relatives of the bighorn sheep found in the Rocky Mountains and coastal ranges to the south, their white fur distinguishing them clearly from their tan cousins. During the summer months, males tend to live higher in the mountains, separate from the small herds of females and kids; you may see the distinctive curved rams horns less often than the ewes more delicate version. The dominance ritual of rams smashing horns in a head-on collision is easier to hear than see during the fall rut. 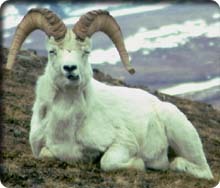 Look for Dall sheep in the higher reaches of the Alaska, Wrangell, Chugach, St. Elias, and Kenai Ranges. The Denali Park Road, Sheep Mountain on the Glenn Highway, and the Seward Highway along Turnagain Arm are three good areas to see them. of the small Sitka black-tailed deer browse the wooded areas and mountainsides in the Southeast, Kodiak, and around Prince William Sound. When you see your fiftieth bald eagle perched atop a Sitka spruce, diving for fish in the harbor, or soaring over the channels of the Southeast, you might begin to take them for granted (I still dont). Eagles are most easily seen from a kayak or the deck of a boat in the sheltered waters of the Southeast, Prince William Sound, and Kenai Fjords. They can also be found within several miles of forested areas up into the Alaska Range, and even further north and west. They gather around late-run salmon streams as things begin to freeze up for an autumn feastup to 4,000 can be found in or near the Alaska Chilkat Bald Eagle Reserve north of Haines from late September into December. Other birds of prey include golden eagles, peregrine falcons, gyrfalcons, and hawks. Snowy owls can occasionally be seen perching regally or flying silently in the twilight. The scavenging, opportunistic raven, the most widespread bird on the continent, is found in many terrains. Fifty million migratory birds nest in Alaska, most on Pacific Ocean and Bering Sea islands, protected coastlands, or in the vast refuges of the Interior. Several types of geese are commonly seen, including Canada, snow, and emperor. The once rare Aleutian Canada goose, smaller cousin of the regular Canada goose, now thrives in the Southwest. Beautiful trumpeter swans, weighing upwards of 35 pounds, can be observed near Nome and along the Parks Highway and other roads. Many types of ducks are easily seen, including the spectacled eider. Seabirds include the ubiquitous gulls, terns, murres, kittiwakes, and cormorants. Coastal ferries and tour boats offer good looks at rookeries that often host odd collections of reluctant neighbors. One of the more interesting residents is the puffin. With its colorful, triangular beak, bright orange feet, slicked-back white-streaked head feathers, and wave-dodging flight, they are very popular with wildlife viewers. The willow ptarmigan is a common game bird. This none-too-bright bird needs the year-round camouflage it enjoys, its feathers turning from mottled brown to pure white as the winter snows fly. Once seen, its easy to get close enough to observe individuals or small groups, perhaps as one offers a mock broken-wing diversion, or a male displays his puffed-chest, cooing courtship dance. If youre driving, stay in your car. Ptarmigans, like many other animals, fear your vehicle far less than they fear you. Many tour companies emphasize bird observation, some offering exclusive birding adventures. Details are offered in the regional chapters and appendix. Both gray whales and humpbacks reach the northern end of their annual migration in Alaskas waters. Grays come up from California to feed in coastal waters, while humpbacks arrive from Hawaii. The lucky traveler will see a whale breach, rising from the deep at great enough speed to lift its bulk completely from the water before it crashes again into the sea. Its an unforgettable sight. Humpbacks are commonly seen rolling through the water by travelers in the Southeast, puffs of mist spouting from their blowholes. Typically, they spout three or four times before diving deep, exposing their unmistakable tail flukes as they do so. As baleen whales, they filter tiny krill out of the water, often driving them together in a spiraling tube of bubbles before rising through the tube with baleen exposed. Minke whales are common in Alaska waters, as are killer whales or orcas. The 6-foot, black dorsal fins of a pod of killer whales (really members of the dolphin family) are an impressive and slightly disquieting sight, though they feed on fish and the occasional seal or otter, not on humans. White beluga whales (also really dolphins) are seen in large pods in the shallows of Cook Inlet where they live, presumably to avoid deep-water predators. Belugas are sometimes beached at low tide, usually with no ill effects. Bowhead whales are found in the Bering Sea and Arctic Ocean waters. Dall and harbor porpoises are commonly seen racing along in the bow waves of ferries or heading rapidly across a channel. Seals are frequently observed bobbing in a harbor or lying about on rocks or beaches. Once-threatened fur seals are now strongly represented, with the biggest concentrations found on the remarkable Pribilof Islands in the Bering Sea. The still-threatened Stellers sea lion hangs on in Alaska in moderate numbers, but suffers from competition with commercial fishers and does not yet enjoy stability. Walruses can be seen at several places along the Bering Coast, particularly in the Walrus Islands State Game Sanctuary (permit required) near Togiak on Bristol Bay. Sea otters, once hunted to near extinction, are now fairly common residents of the calmer waters along the south coast. A recent decline in their numbers has caused concern. Look for them floating on their backs in the waves, preening or cracking shellfish. The vegetation patterns of Alaska are quite complex, but three basic categories dominate the Alaskan landscape: tundra, taiga or boreal forest, and coastal forest. The Alaska Field Office of the U.S. Geological Survey identifies 20 distinct "ecoregions" that demonstrate a unique combination of climate, landform, and vegetation. A view of the ecoregions is very helpful in understanding the details of vegetation and habitat of specific destinations. Complete information is available online here or via the USGS (see the Appendix). About half of Alaska is covered with tundramixed short vegetation featuring mosses, lichens, grasses, and dwarf shrubs. Alpine tundra is found above treeline in all of Alaskas mountain ranges, usually changing from thick scrub and deep spongy tundra to thinner, shorter plants on high slopes and ridges. Arctic tundra usually overlies permafrost. It varies in wetness, thickness, and plant profile due to a number of factors, including climate, soil, freeze-melt schedules, drainage, and elevation. The short growing season in tundra areas results in a sudden profusion of growth and blooming when summer arrives. Beautiful wildflower displays are characteristic of drier, higher zones. a transitional vegetation zone between wetland and dryland, is essentially a tufty, wet peat bog that may support scraggly black spruce. Fire is important in shaping the distribution of vegetation in the taiga, with a natural succession of plants in burned zones proceeding from fireweed, through birch and aspen, and finally to spruce. The boreal forest grows to about 3,000 feet in elevation in the east, though the maximum elevation declines moving west and north toward treeline. Alaskas coastal forest, dominated by Sitka spruce and western hemlock, is found in temperate, well-watered, and well-drained coastal regions from the panhandle through Prince William Sound, and as far west as Afognak and northern Kodiak Island. Rain-forest conditions exist in several areas unsheltered by mountains, with old-growth trees growing to great heights.